On Sunday, April 21, 2013 I ran my first Yonge Street 10k and I cannot wait to run it again next year. It was a great race from start to finish. 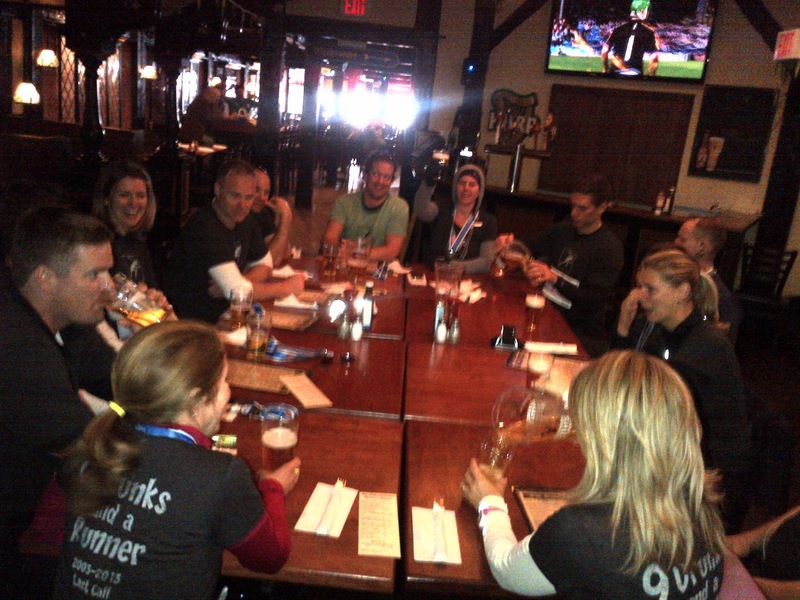 The organization, the volunteers, the course, the post race - everything was pretty much exceptional. 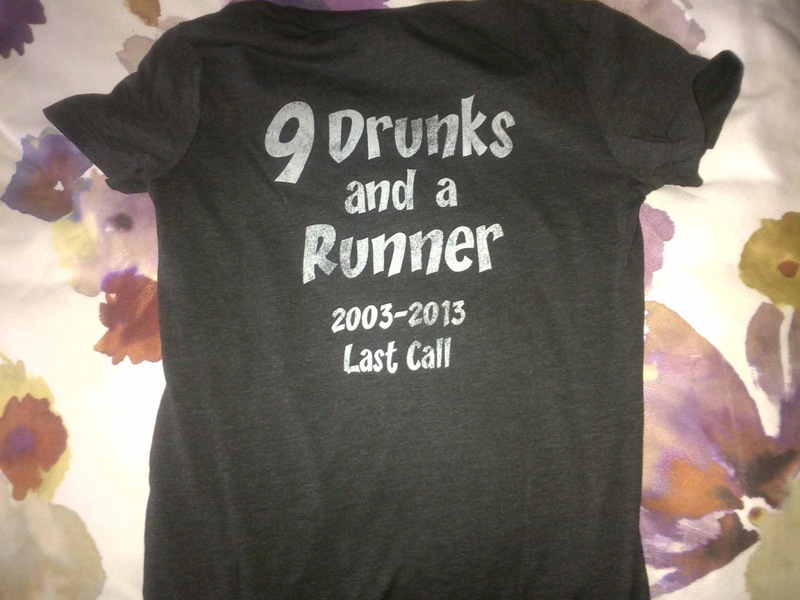 To make this race a little more fun, I was running with Team "9 Drunks and a Runner". It was my first time running with this team but the 10th and apparently final year the team will run. 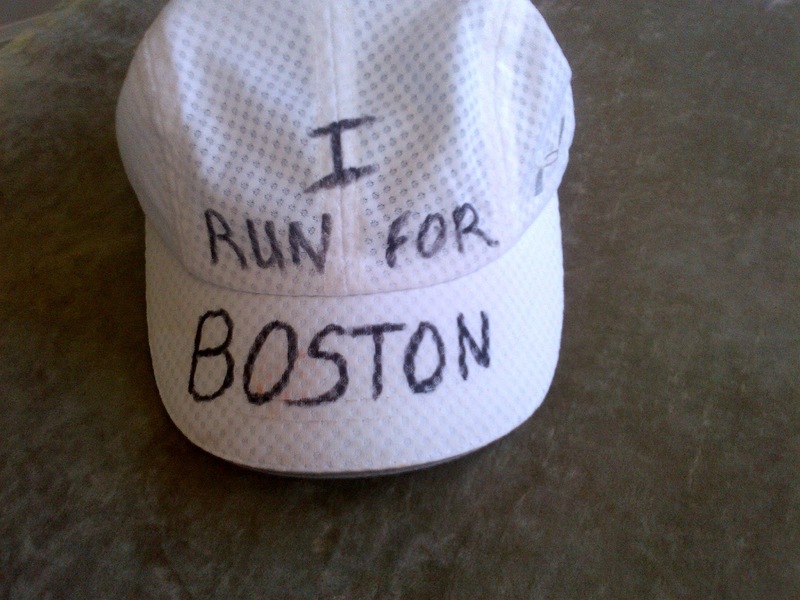 Also, like most everyone else running on Sunday, I ran for Boston. It was a cold start to the day - but not nearly as cold as I feared. The race starts up north of Eglington and finishes a Fort York - it's a net down hill run with only 1 substantial climb and a few flats. It is a fast race for sure! I had signed up to run this race as a time trial for my pacing at my up coming Ottawa Half Marathon in May so I knew I wanted to run it hard and as fast as I could. I was looking to break 45 mins, but like always, in my head I was thinking 42 minutes. We got to the start with plenty of time but before I knew it, they were calling last call for checked bags. I ran all the way to the back of the corrals and made it with seconds to spare. I have to say, the bag check was so well organized! I don't normally check a bag but since it was so cold I figured I would need something warm at the finish. I made my way to the Red corral and luckily found my training buddy Chad who so graciously decided to pace me. We made our way near the front of the corral and we were probably only 10 feet from the start line. Next thing we knew we were off. Running a 10k race is actually a crazy distance for me since I have been endurance racing for the past few years. It's full out effort the entire way and when your lungs and heart are screaming at 5k you still have another 5k to go. My coach had told me to shoot for around 43 minutes, averaging about a 4:15 min/km. I clocked my first kilometre in at 4:16 and thought not bad. However, my heart rate was pretty high and I knew I had to get it under control if I was going to hang on to this for nearly 40 more minutes. The only real climb on this run happens around the 2nd km mark and I was huffing and puffing when I made it to the top. It was nice to see a fellow Toronto Triathlon Club member at the top of the hill - I gave Graham a big wave but didn't have the talking ability to say hi (Our club was volunteering so there were quite a few familiar faces on the course). I focused on my exhale and tried to allow the down hill to bring my heart rate and breathing rate down. Listening to Chad chat was also very helpful but it was definitely a one sided chat! We clicked out the first 5 km in 21 minutes (4:16, 4:09. 4:11, 4:03, 4:16) - my fastest 5km prior to today was 23:04. By the 6th kilometre I was really feeling it. My legs were fine, my heart and lungs were screaming. I got horrible cramp right in the middle of my diaphragm and it became painful to breath. This is where having a buddy pace you really comes in handy. Chad said all the right things to keep me moving though my pace slowed to 4:16 and 4:17 for the 6 and 7th km. 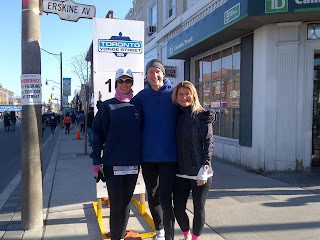 We saw LeanneB (another TTC member volunteering on the course) and she gave us a big cheer and ran after us a bit. That was uplifting because I was really starting to fall apart at that point. Again, Chad continued to say the right things - "imagine we just got off a 80k bike ride and we are going for a 3 1/2 km run". I continued to focus on my breathing. Kilometre 8 clocked in at 4:06 and I though maybe I would sustain that for the next 2 but I was definitely losing steam. I put my head down and ran. Kilometre 9 was a disappointing 4:15. We made the turn over the railway bridge and we only had 500 meters to go. I knew this was when Chad would turn on the burners as we had discussed. He looked over his shoulder and said "just follow me". I tried - I really tried - I turned on my burners and there was nothing left. I pushed and I tried to pick up my speed but alas, I was done. My 10th km clicked off on my garmin about 20 feet from the finish and it was a heart breaking 4:19. I put my head down and ran that last 20 feet as fast as I could. Chad was in the finishing shoot waiting for me. The sun was shining and it was temporarily very hot. I remember walking in the middle of the shoot and saying "guess if I'm going to puke I shouldn't do it in the middle of the road". Luckily the puking sensation abated (hey, if you don't feel like you are going to puke then you didn't run hard enough right?). Of course I forgot to hit the stop button on my Garmin so I wasn't sure of my time but I did see the clock and is was around 42:30 - later I found out my official time was 42:25.4. 10/370 in the F 40-44 age group, 49/3089 woman and 353/5610 overall. I missed my 42 min by 25 seconds, but in the end, I took almost 7 minutes off my one and only other 10k race I have done (Tanenbaum 10k 2011 - 49:22). The finish area of the race is very well laid out. I had no problem at all getting my bag. There were a couple of food tents so line ups weren't bad. There was just the traditional post race food: bagels (not great for this GF gal), apples and bananas and plenty of gatorade and water. There were a few sponsor tents as well but I didn't really check them out. We wait for the rest of our team to finish and we ended up being the 4th mixed team out of 20. And as I suspected, I was the runner of the group with the fastest time. We grabbed a cab back to the start line - I will not go into the awful details of this very expensive cab ride (next year we will buy the shuttle bus tickets), and met up with the team for brunch and of course a few beers. 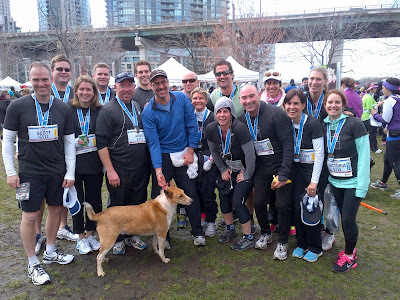 Sadly, it seems this team has run it's last Toronto Yonge Street 10k, though personally, I hope to change their minds next year! I'm sure if I had been able to stick around while the group put down 14 pitchers of beer I would have succeeded! Looking back on the execution of this race, I'm not sure I would have done anything differently. I could have tried going out slower and picking up time along the way but with a 10km it seems like a constant effort is needed. I didn't negative split, I was 25 seconds slower on the back 5km, but again, with such a short race does that really matter? My next 10km that I run will be the last leg of the Toronto Triathlon Festival in July and if I can break 45 minutes on that day I will be happy. But for now, I will continue to train for my next race - the Ottawa Half Marathon in May and of course Mt. Tremblant 70.3 in June! To recap, I loved the course, the organization was great and the volunteers superb! 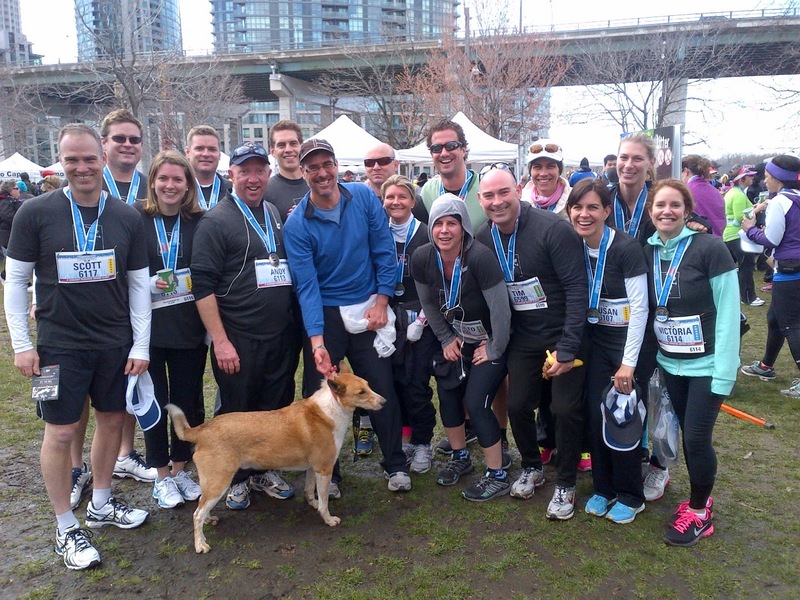 I would highly recommend this race to everyone and I look forward to running it next year!